The links above are not meant to be taken as evidence. They are proof that even exerts in psychology can share my views. With that aside, I would argue that while whether it can be considered romantic or not, there is definitely a lot of chemistry between them. You can claim that this is all platonic, brotherly, sibling love or whatever cockamamie term you want to use, but that doesn't make it so. And please don't think I am stupid, I KNOW that it doesn't necessarily mean that it is romantic either, but simply put, it is open to interpretation -- therefore you are not necessarily right or wrong and neither am I. Still, the chemistry between Hayate and Nagi, the bond between them, so to speak, was actually built from the ground up. People often claim that their romantic relationship was forced, but considering the actual connection they had with each other which was the very foundation of the manga from start to finish, it was actually a well-earned start to their romantic relationship at the end. I talked about this over here. Over the course of the series, we see how Nagi's love for Hayate develops from that of a simple crush -- to that of true love, albeit, not quite reciprocal love until the ending. Similarly, we see how Hayate's strong feelings for Nagi evolves from feelings of wanting to protect her into someone for whom he would really give up his life for -- an all important question which had to be asked near the end of the story according to Hata's blog. Of course, according to the same blog, Hata only noticed that it was in chapter 567 when Hayate saw the 14 year-old Nagi's profile as she was talking that he (Hata) realized that this was the moment. Of course, most people tend to interpret this as the moment Hayate fell in love with Nagi -- of course, I propose an alternative interpretation. Rather than Hayate falling in love with Nagi at that exact moment, it could also be that he had always subconsciously considered Nagi desirable, it was just at that moment when his psychological defenses were weakened that he realized that "oh, she's not a little kid anymore." I think either interpretation is valid -- it's just that mine actually justifies the ending better. The chemistry between them is subtly portrayed throughout the series as well. It's seen in what some may consider to be their usual snarky back and forth banter. Seriously though, that snarky banter actually denotes a level of closeness that is only reserved for significant others. A little bit more intimacy and they would actually be a couple at the middle of the series -- of course, Hata did not go this route -- which is fine with me. It doesn't invalidate the fact that Hayate eventually got to know Nagi so well that he felt that looking at her wasting time by playing video games or watching anime all day is relaxing or that Nagi knew Hayate well enough for there to be an implicit understanding between them whenever Hayate got into trouble. Nagi understood that it was a problem concerning some girl and that Hayate needed time to sort it out himself. A great confirmation of Nagi's character development and a subtle way of developing the HayaNagi ship. Again -- showing the deep connection between these two despite of the huge misunderstanding bomb looming between them. With that said, that concludes this week's Hayate reflections. I'll be back on the 24th with some special fanart for HayaNagi day and perhaps another short post. See you then! 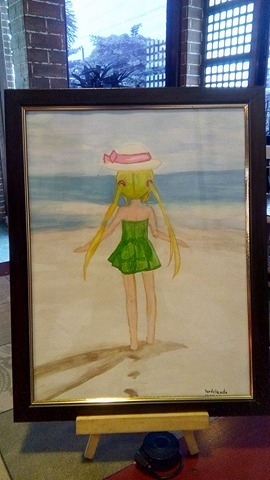 This is my first time using professional artist grade watercolors on Canson watercolor paper. Painted with my Kuretake Gansai Tambi 36 color set. This scene was inspired by a recent visit to the beach. 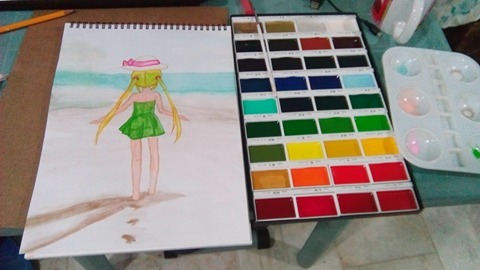 I have to say, this watercolor set was well worth the steep price. Smooth colors and nice, strong pigments. They also mix very well. I had to do a bit of mixing to get the skin tone since the set doesn't seem to have any colors similar to Nagi's usual skin color. This fanart got noticed by Hata-sensei on twitter, by the way. Just like how Nagi's love for hayate developed from a crush to an actual romantic love, I believe hayate's love for Nagi also underwent some transformations. I think he saw her as a saviour when she saved him. He also saw her as his family but the role too changed through the course of time. He had never questioned what Nagi truly meant for him and has only declared that he wants to protect her. But gradually there has been change in the tone of those declarations and in the way he saw Nagi. I would say that hayate saw in Nagi the ideal person that he had always wanted, a friend, a family, a saviour and a true love, everything that he never got the opportunity to find until he met her. And that's when the confusion started because when he no longer could use the debt as an excuse to be with her, he had to question why. And he wasn't comfortable with that. At the same time, he didn't want to lose her. As for chemistry, I think we all know that there's more than enough proof in the manga; chemistry doesn't just involve touching or anything like that but can be evident through meaningful and fun conversations as well. When two people enjoy each other's company and are comfortable around each other, that's where the chemistry lies. Unfortunately many people only read/see/hear what they want to and the evidence thus goes unread/unseen/unheard of. Quite true unfortunately. We also have a whole lot of enablers who encourage this type of behavior from the haters. The enablers usually don't read the manga but just skim it to see if their favorite girl is winning. Then when they see a scathing opinion that agrees with theirs from a more well-informed fan, they either encourage or parrot the misinformation from said fan and it spreads across the fandom like a wildfire. A good example of this would be when someone started the rumor that Hayate and Nagi were siblings near the end of the manga. A lot of people on facebook and twitter took this rumor at face value without even bothering to check the actual manga.